So my husband and I went to Boca on Sunday, and it was fabulous. I took notes, took pictures and fully planned to write deeply meaningful things about it on the blog, but when I sat down to write it up, it just wasn't there. I have LOVED writing this blog. It has meant so much to me. It made feel part of my community and helped me connect to incredible people. I've learned about amazing restaurants and events. I'm so grateful for the time I've been able to develop this blog, but it's time to shake things up. Thank you for reading. Thank you for commenting. Thank you for educating me about this weird, lovely little city. Thank you. Kids + Summer = ??? Fairfield County has a plethora of things to do with little kids but when it’s 8am in your house and you’re already pulling your hair out with stir-crazy children running around you in circles, it can be hard to think much less put together a plan to go out! Relax, review the list below and just make sure to pack snacks, sippy cups and diapers for the car!! • Silverman Farm: Great petting zoo; you pay 25 cents to feed the animals. Awesome for picking apples, peaches and pumpkins. • Chestnut Hill Park: Stamford. Lots of kids in good weather – like instant play dates. • Mead Park: Best park café around. • New Canaan Nature Center: Awesome large birds and other animals. Great Natural Playground for kids. • Aquarium: Norwalk (good indoor activity). • Bronx Zoo — super big and super fabulous! • Sheffield Island Lighthouse and Nature Trail. • Lake Compounce – awesome amusement park. 1 hr and 15 mins away. • Miniature Golf Norwalk (next to Calf Pasture Beach) $5 per person for 18 holes. • KidCity Middletown. Abt 60 miles from Stamford. Great Children’s Museum. Get reciprocity if you have Stepping Stones Family member plus. • Go Wild in Greenwich. Family Field Day and Hot Air Balloon Ride. • New Haven Trolley Museum. • Fire Department — almost any will let you tour anytime. • Any Construction site provides great joy for my boys. • Schooner in Stamford. Sound Waters You can have an afternoon sail with the whole family, or a sunset sail with dad. • Choo Choo: Ride on the train just one station or to Grand Central. My boys LOVE this. • Aviation Museum, Long Island (right next door to Fire Museum.Very very cool, parents will love too! • Bridgeport Bluefish Baseball: Tickets $7- $18 each. You can get a group discount. We had a BLAST last year. The stadium is small and manageable. Plus lots for kids to do in the kids area. • Train Museum in Danbury: Fall Foliage Rail Excursion – train goes from Danbury to the charming town of Kent. Pumpkin Patch Trains In addition to the train stuff, they also have fun fall stuff those days (cider, cookies, coloring station etc). Santa Trains too. Birthday parties too: Sat: 11am — 1pm, 2pm -4pm and Sunday 2-4pm Danburyrail.org for more info. The pitfall is that Danbury is kind of a hike but it opens at 10 so if you leave early, you can spend just enough time to get home for the nap. • Brooklyn Childrens Museum (reciprocity w Stepping Stones family plus). • Long Island Children’s Museum. • Peabody Museum in New Haven: They have a great exhibit on the earth (interactive), very large dinosaur models, a room of taxidermy birds, and small room upstairs where kids can watch ants building a colony see reptiles. • Westport has a pretty good children’s series in summer too (magic shows, puppet shows, concerts, etc). • Kayaking: Family Fun for all! • The Shore Line Trolley Museum: $8 adults; $4 kids 2-5yo; Ride the historic Branford Electric Railway; take the trolley to a shady picnic grove; see trolleys and artifacts of the trolley era; watch craftspeople in the restoration shop. • Railroad Museum of New England in Naugatuck (Litchfield Hills). Take an hour long ride with vistas of scenic waterway, the region’s wildlife, and the Thomaston Dam. • The Philip Johnson Glass House: $30-$45 per person (all ages including children); Okay, so this isn’t exactly family friendly, but if you can go your should. I’ve been trying but the first two seasons have been sold out!…The mission of the Philip Johnson Glass House is for the 47-acre campus to become a center-point and catalyst for the preservation of modern architecture, landscape, and art, and a canvas for inspiration, experimentation and cultivation honoring the legacy of Philip Johnson (1906–2005) and David Whitney (1939–2005). In addition to guided tours, the Glass House will launch programs and provide national leadership in the preservation of the Modern. May Fair, the Saturday before Mother’s Day. It is the largest one day fair in the state of Connecticut. They also have a huge tag sale as part of it. It is held at St. Mark’s Church in New Canaan. Lots of fun! Phew! So that's the CT Moms post, and I'm tired just copying it! It's been a great inspiration for us. Hope it helps you have a fabulous summer. Nora Ephron always know just the thing to say. - On the sexes: "Men dominate the conversation in Washington and therefore, as far as I am concerned, the conversations are far less interesting than those in New York." - On life lessons: "My mother wanted us to understand that the tragedies of your life one day have the potential to be comic stories the next." The writer behind When Harry Met Sally and Sleepless in Seattle who passed away just about a year ago, lives on in Norwalk. The play she wrote alongside sister, Delia Ephron, is called Love, Loss and What I Wore and it's coming to the Carriage House Arts Center. Enjoy wine, cheese and a top notch play. You can see it next weekend, and that's it! There will be shows only from July 26 to the 28th. What's really cool is you can get in FOR FREE with the donation of a women's business suit as it's supporting Dress for Success. No suit to donate? Still a very handbook happy $20. "We're Not Very Good People"
So said Craig Wilder, Professor of History and Head, MIT History section. 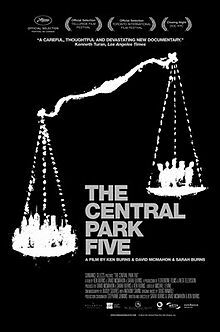 By the end of the documentary, "The Central Park Five," I believed him. The movie profiles the attack on the Central Park Jogger in 1989 and the countless tragedies that came out of it. Trisha Meili was victimized and beaten beyond recognition. Five teens were wrongfully convicted and sentenced to between five and fifteen years. The real perpetrator, Matias Reyes, continued to wreak havoc until he confessed to the crime in 2002. After years of wasting their young lives behind bars, the Central Park Five were finally released. The crime was a brutal one, but there was no blood evidence. There was no forensic evidence. There was little evidence at all, but each conviction hinged on the video taped confessions of the alleged perpetrators. It's incredible to imagine how these young men could have implicated themselves so thoroughly and how a few minutes in front of a video camera could have destroyed their young lives, but that's exactly what happened. The film gives some sense of the exhaustion, deception and false promises that could have resulted in the manufacture of their false confessions. Still, the viewer is still left wondering how in the world that could have happened? How could so many smart people have been so wrong? It's a movie that helps you learn the story that the media never really tells: what does it mean to have been wrongfully convicted? How does it happen? Where did we fail? It's common to hear stories about people released from prison after years of incarceration for crimes they didn't commit, but it's so rare that you get the opportunity to hear how we got there and what happened next. This movie takes the time to tell that important story It's not pretty. It's a story of human frailty, fear, race and politics, and it's a vital one we all should hear. I hope we're good people, but this movie is an eye opener that highlights how we fall far short of the ideal. There's no hope of our getting better without learning from mistakes like this one. You know, I never wanted this blog to be about me, but the world is just a little too much with me right now. It's not a bad place to be, it's just an in between sort of place. I'm in a summertime limbo. We've bought a new house...or almost bought a new house since closing is the end of July, and I'm still wrapping my head around it. If it all goes according to plan, we'll be in North Stamford by season's end. So what does that mean? - A bigger house for my growing boy to roll around in. - A place for my parents to stay that doesn't cost a fortune (at last!). - A walk of about 5 minutes to get to some of the prettiest parts of our fair city: the Bartlett Arboretum and Stamford Nature Center beyond. - A wall of windows, which I've always wanted. - An investment in my family's future. - A bigger, scarier mortgage. - A bigger, scarier - but much more beautiful - piece of property to maintain. - No more walks to Lorca, which I've grown to love. - No more walks to Mill River, which has grown into a mid-city gem. - No more walks to the movies or to dinner. Ok, so we will sip, stroll, watch and eat again, but I don't want us to forget the lovely things we're leaving behind. In the short term, it means boxes and boxes. I'm dreaming of boxes. We haven't gotten our place on the market yet, and there are obscene numbers of boxes still to come. I've been dreaming of future boxes stacking up over my head and up several stories of walls of windows. Moving is awful, and I'm a little nervous about leaving a place that's totally imperfect, but that I've grown to adore. We're not going far, but I'll still miss what's been close. There is so much cool artiness in Stamford right now, it makes me feel like throwing a pot. First of all, sculptures have sprouted all over town from the Art in Public Places exhibit. The theme this year is abstractions, and they're all over the block - literally and figuratively. Which ones do you like? I'm kind of digging David Boyajian's work. It looks like stills of dancers pivoting on point. The multi-colored Carole Eisner is too much for me to swallow, but the monochromatic ones put all the color in the movement, which is much lovelier. David Hostetler is a bit to stark for me. Kevin Robb's work seems to be just about to topple over, which gives you just a little refreshing breathlessness. Boaz Vaadia's sculptures seem to be made out of million year old mineral deposits, stalagmiting up the sidewalk as if we've been welcoming Jerry Springer since the dawn of time. Not enough artiness? But wait - there's more! Join your Stamford neighbors et al for Artwalk on Friday, June 14th from 6-9pm and Saturday, June 15th from 10am-7pm. My fabulous friend, MKS, has a very talented husband showing at the event. Artwalk will feature 95 artists all told, art for sale, galleries a'plenty, all sorts of mediums, refreshments, live music and not a nickel to get in. Should be swell, and you should be there! 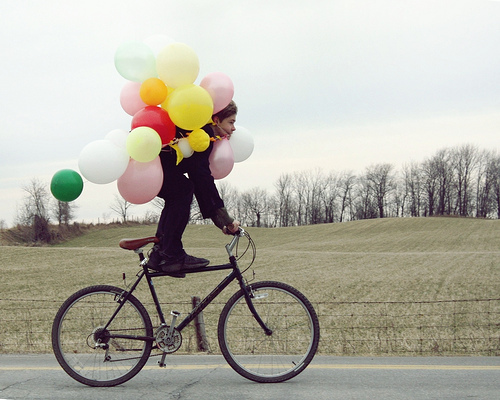 On May 17th (aka, this Friday) join your fellow commuters in Bike to Work Day. It's exercise, fresh air, saving on gas - what's not to like?! The Stamford Times points to an increase in bike commuters, saying the 2010 Census has those numbers up 40% across the US and 50% in CT since 2000. Stamford has a downtown event to celebrate your pedal power too. From 7:30 to 9am, join your neighbors in Veteran's Park at the corner of Atlantic and Main Streets for giveaways and free refreshments (and a few bragging rights). There are similar events all throughout CT. See the Bike to Work Day link above for a full listing. Spring is in the air and the cherry trees in Mill River Park are starting to bloom. The Park’s grand opening is the first weekend in May, and it’s actually starting to look like a real park. On Friday, May 3, Mill River is launching its Spielberg at Sunset outdoor movie series, in partnership with the Avon Theatre. Movies include Raiders of the Lost Ark, ET, Goonies and more. 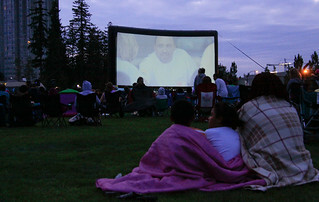 There will be a DJ starting at 6:30pm, and the movie will begin at sunset. If we could get a food truck or two to show up, that would be ideal. El Charrito? Melt Mobile? On Saturday, May 4, the Swingset Mamas will be performing at Mill River Playground, there will be zumba and yoga drop-ins in the park, bird walks, a performance of the “Rejuvenary River Circus,” and more. It looks like the Fun Saturday Mornings performances at the Mill River playground will continue this summer, but the lineup has not been released yet. We saw “Boogie Chillun” at the playground last summer, and we were ready to book them for our next private event. SN again: it sounds fabulous, and we'll be there with bells on ourselves!